Welcome! Diplomaticcorp is a place for friends to play the board game Diplomacy online. Our games are played by email with a human GM - join a game. Congratulations to Jerome for winning the Diplomacy Winter Blitz 2014! 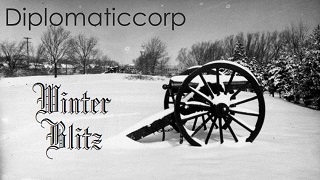 New users: Welcome to Diplomaticcorp: A play-by-email Diplomacy community! You've found the best place to play Diplomacy on the web. To get started, register your favorite username, then join an open game. Returning users: Welcome back! We hope you find the new environment enjoyable and full of rich content related to Diplomacy (the board game). Many things have moved, although most of what you're used to is still here in the drop down menus at the top of the page. Please share any feedback on the new site, integrated forum, and enriched content in the Help & Suggestions forum. All you have to do is Log In using your old username to access your account, games, and the forums. Each game is run by a GM, a live person who administers the game, including being a neutral person who adjudicates each turn (with the help of software). All - we have been sitting at 7 players for the open re004 (aka HAVEN variant) for some time.